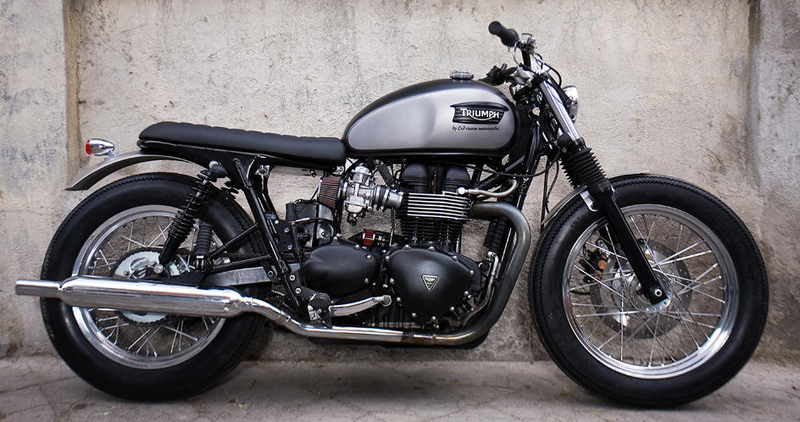 We return to Madrid with the order to build CRD12 Cafe Racer, another Triumph Bonneville, we decide to lower both the suspensions front and rear, increasing the width between both tires, also both the rear and front rims were changed as well as a new rear tire 18 “. The name ‘Silver eyes’ is given by the color of the deposit that looks silvery but in fact are two tears pickled on a deposit painted black, leaving the original metal in sight. It is the first bike to use this aesthetic technique that is so demanded and so fashionable now. The ignition key is inserted in the subcarp with car boot (clausor), subchassis trimmed and redone by Cafe Racer Dreams. Alberto, his owner, was delighted with the result. Once again, the successful formula of less is more, continues to give good results. You can read here the article that Bike Exif wrote about CRD12 Cafe Racer. If you are interested in making a motorcycle like this you can contact us by filling out the following form.